Slowly but surely I’ve been amassing a small library of academic writing books. Not because I love dispensing advice, but because a lot of people ask me to recommend books, and others suggest the ones that have worked for them. But first, a disclosure statement: I buy absolutely each and every single one of my books (except for the ones, of course, authors gift me or academic publishing houses send me in lieu of payment or as a token of appreciation). Public service announcement: I buy my own books with my own money and I get absolutely zero royalties or kickback from recommending them. Writing productivity research and advice can be summarized in a single sentence: In order to be productive we need frequent, low stress contact with a writing project we enjoy. 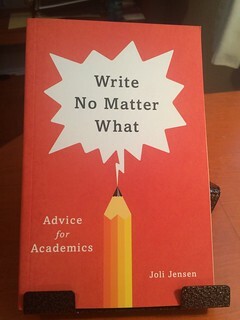 Joli Jensen summarises what at the core, I believe is what helps ME move forward with my writing: I write every day, and I try to make it low stress by writing memorandums, analysing data and synthesising my thoughts in a conceptual map. I also write by hand in my Everything Notebook section for a specific project I am undertaking. These handwritten notes, these processes really help me think and develop my thoughts. That’s why I don’t like to sit down and crank out a paper. I need to slowly and steadily think and process what I’m learning. And this is the reason why I write and read every day and I try to be in contact with my data regularly. Jensen’s advice on writing at least 15 minutes a day resonates with what Jo Van Every suggests in her 15 Minutes Challenge. I know for a fact that if I sit down and scribble notes on a book, book chapter or journal article, I can write at least a few words. And a few words is better than NO WORDS. I really enjoyed Jensen’s honesty in attributing ideas to who originated them. She credits the idea of the 3 taming techniques to David Steinberg’s “How to Survive and Complete a Doctoral Dissertation“. I have to confess that I have not read Steinberg’s book, but I really enjoyed reading Joli Jensen’s account of what she learned from him and how those teachings became her three taming techniques. There’s also something extraordinarily refreshing about an author of an academic writing book who confesses to facing the same insecurities and anxieties that we all face. As I said on Twitter, I write every day and I find myself stuck for MONTHS in a particular idea or without solving a specific set of analyses. Then BOOM, it all comes together. I definitely would recommend Jensen’s book to students and professors alike. I really enjoyed reading it.